There doesn't seem to be much of a middle ground when it comes to okra - people either love it or hate it. I happen to love it - fried, grilled, toasted, in soups and stews, mixed into fritters, in a salad, pickled... any way, any time, I love it. So when it's in season and abundant during the summer, I buy a basket from the farmer's market every weekend. Usually it ends up being thrown on the grill or dry-roasted. While fried okra is one of my favorite things ever, it is a bit labor-intensive, not to mention messy and yes, very unhealthy. This cornmeal-crusted okra is a great alternative to fried okra. 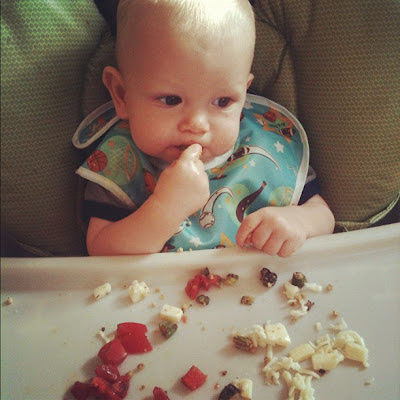 It is somewhat healthier, makes little-to-no mess, is very low-maintenance, and comes together quite quickly. It's still crispy like fried okra, yet the okra really shines here since it's not battered and deep-fried. Joey loved it, and suggested that I start making it like this for snacks. Smith couldn't get enough either! I did something kind of crazy and unconventional with this okra, so check back tomorrow - it was definitely a successful experiment! 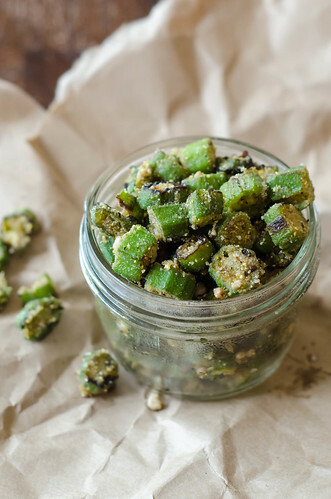 So okra: love it or hate it? In a large skillet (preferably nonstick), heat 3 tablespoons of the oil over medium-high heat. Add the okra, stir to coat, and cover. Reduce the heat to medium and cook, stirring frequently, until the okra is bright green, 10-12 minutes. Season generously with salt and pepper, then sprinkle the cornmeal over the okra. Stir to coat, and drizzle the remaining 3 tablespoons of oil over the top. Continue cooking, stirring frequently, until the okra is tender, browned, and crispy, 5-10 minutes. Taste and season with more salt and pepper if necessary. Serve immediately. I don't know why but I love it steamed, sprinkled with soy sauce and a hint of lemon. The recipe was shared to me by a friend from the MidEast. She was from India and I instantly loved okra. I tried some other okra recipes and I love most of them. Now, this is another recipe for me to try. Looks good! I am thinking of going to the store to get okra and having this and ONLY this for dinner tonight. I don't drink lemonade nearly enough but it really is so tasty! I especially love the blackberry infusion...tart on tart is totally my kind of thing. Blackberry and lemon: so good! I've been devouring blackberry lemonade popsicles since spring. This looks so good. Oh my gosh - I stumbled across this when looking for a gf/cornmeal fried okra and I just wanted to weigh in on the okra question. I think okra is devine. It's buttery and delicious...having grown up in the south, fried okra was a mainstay. We also had it pickled, grilled, and stewed with tomatos and zucchini quite often - still one of my favorite dishes. My fiance, a northern boy, originally, thought he hated it because he'd cooked a bag of frozen okra once and was disgusted by the slime. I've since changed his opinion. I think more people would like it if someone prepared it correctly for them. It's one of my favorite umami flavors! Thanks for this recipe and for the lovely photos.